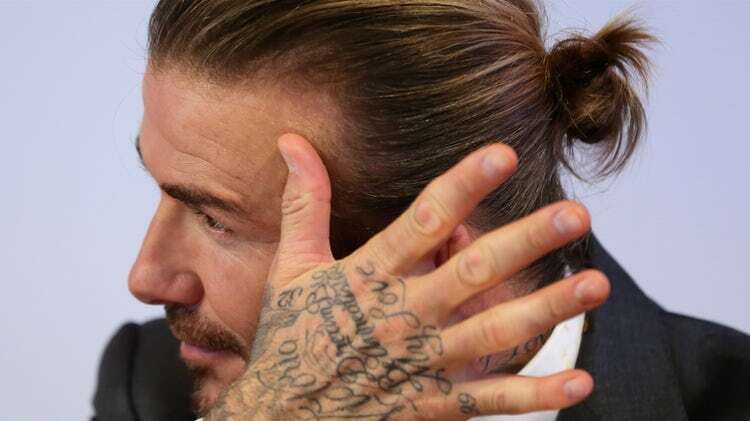 Trust us, every single guy wants long, thick locks like David Beckham once sported. Problem is, we’re not all sure what the best hairstyles for men with long hair really are, as there’s the shaggy, just-rolled-out-of-bed look, the still wet and just-got-out-of-the-shower look and, of course, the pulled-back-into-a-ponytail-because-I’m-lazy AF look. But, just because you have more hair than Sasquatch doesn’t mean you need to look like a frat boy. And, to help you master your look and show-off your handsome self, we did our research and came up with the best hairstyles for men with long hair to make sure that you’ll have the ladies chasing you instead of the other way around. We’re loving these long, one-length hairstyles donned by these badass men. Here’s how you can emulate their style. What To Ask Your Barber For: First off, Jason Mamoa is already all-time, so what guy wouldn’t want to look like him? When attempting it, just ask for a regular trim to keep your locks in tip-top condition with no split ends. You can even opt for a couple of subtle long feathered layers at the front. Other than that, grow, grow, grow! How To Style At Home: With this hairstyle, you can pretty much wash and go. But to avoid any frizz, put some serum in – just a pea-sized amount – on wet hair after washing. For an easy alternative, knot into a messy man-bun like Jason does. What To Ask Your Barber For: Just like the aforementioned Momoa’s, Clay Matthews’ locks are a matter of growing them out as healthy as possible — which means regular trims and even the occasional hair mask. His effortless “still wet and just got out of the shower” look has become his staple, but to be able to pull it off, he makes sure to keep his hair in healthy condition. How To Style At Home: To keep these locks silky smooth, a good conditioner is imperative. You can get a conditioner that only needs to be left in for a minute while you wash your, uh… other parts. For a change of look, slide your hair into a low ponytail like Clay does in the pic above. What To Ask Your Barber For: World famous DJ Steve Aoki is blessed with amazingly strong, straight, long hair — which also happens to be in perfect condition. Your barber will have to trim it regularly to ward off any stray split ends, and if you’re after the kind of quality Aoki has, ask the barber for a deep conditioning treatment. How To Style At Home: If your hair isn’t as straight as Steve’s and this is the look you want, you’d do best to invest in a pair of ceramic hair straighteners. To switch it up a little depending on your mood, you can copy Steve and put on a thick headband. Just below or above the shoulder, these looks are great for that just-grown-out phase, and are pretty manageable too. What To Ask Your Barber For: For this version of The David (‘cause let’s face it, he’s had a lot of looks), you want to ask for a nice medium, shoulder-length cut with no layers at the back, and a couple of subtle long layers at the front. How To Style At Home: This is a fairly easy wash-and-go style, but to keep it straight, you can blow it out with a hairdryer or use some straighteners. Keep it in a middle part and tuck the sides behind the ears. Alternatively, slick it back with some gel (only a little bit; you don’t want to look like you’re Uncle Harry from the ‘80s). What To Ask Your Barber For: Jared’s shoulder length hair has a lot of body and it’s all thanks to the layers (OK, and his amazing genes). So, to get this look, you’ll have to ask your barber for a full head of layers starting at around the top of the ears. How To Style At Home: Put some serum in right after washing, then either air-dry or blow-dry, rub some pomade (a pea-sized amount) in the palms of your hands and rub all over, twisting the ends and random pieces of hair for some texture. For an alternative look that’s a bit more informal, don’t be afraid to pull back into a tiny pony. What To Ask Your Barber For: Harry Styles’ hairstyle is extremely popular with the ladies (or maybe that’s just Harry) and it works well as a one-lengther. Adding a few longer layers at the front and back, starting from the chin downwards, adds a bit more body. Your barber should cut it as if you would wear it in a middle part, but it works just as well as a slightly off-to-the-side part too. How To Style At Home: Harry’s all about “effortless”. You can get away with just washing and going (don’t forget the serum to avoid frizz) or blow-drying with your hands or a diffuser. If ever your hair screams casual, this is it — but it’s tamed perfectly. For those more daring, try a shaved sides long top look that is sure to turn heads everywhere you go. What To Ask Your Barber For: Now this is a style and a half! To replicate the style of our favorite viking, you need to get a good undercut buzzcut, about four fingers above each ear and going all the way around the head. This needs to be repeated at least once a month to keep it looking fresh. The remaining hair needs to be one length and in great condition, so regular trims and a nice deep-conditioning treatment from your salon every 6-12 weeks are imperative. How To Style At Home: For this awesome high ponytail, you’ll need a few hair-ties. Tie the hair up top using your fingers instead of a brush to avoid it falling flat, and every few inches further down, add in another hair-tie. 8. The Odell Beckham Jr.
What To Ask Your Barber For: Odell Beckham’s signature look is the faded afro-mohawk with highlighted tips… And it’s F’in awesome! Your barber will have to make sure that your fade is on point by using a clipper on minimum gauge, and trim the front and side hairlines as straight as possible. OBJ likes to leave about an inch of roots on display, so make sure your hairdresser doesn’t start the highlights at the root. How To Style At Home: How you style it really depends on what kind of hair you have. If you have hair like Odell’s (which is the best hair to have for this look), then a good water-based hair product on the ends is imperative. If you have straighter hair and want the curlier look, you can wrap it in bendy curlers, and use a diffuser for optimum curls. If you leave it straight, make sure to put some holding product in to avoid it flopping down and taking away the fullness. What To Ask Your Barber For: For this iconic look from Zayn Malik (which was at the time unfortunately the same as Kelly Osbourne’s) your barber will need to do a good shave-fade around three inches above each ear, with a nice and clean simple shaved parting line on either side just before the long top starts. How To Style At Home: The good thing about this haircut is that it even works in the growing-out phase because you don’t really need that much length, just as long as you’re able to pull it back into a high ponytail. Another great thing is that it works with or without product. A flexible style all ‘round! Got curlier hair than Carles Puyol? Don’t worry, here’s how to take care of the hair you were blessed with. What To Ask Your Barber For: He may know nothing, but his barber certainly knows how to keep Kit Harrington’s long, curly locks in tip-top shape. You’ll have to find a hairdresser comfortable in dealing with curly hair, always cut wet, and maybe even use thinning scissors, depending on how thick the hair is. Kit knows that it’s all in the layers. If he didn’t layer his hair, he’d have a respectable fully-fledged 70’s ‘fro. How To Style At Home: Serum needs to be added when the hair is still quite wet, followed by an extra product for curly hair. If you have naturally curly hair, you can air dry, otherwise, those with wavy hair who want Kit’s look should use a diffuser, twisting sections of hair round the fingers till dry. What To Ask Your Barber For: If your hair is so curly that it tends to grow outwards instead of down, fret not — just look at the awesome mop on male model Yassine Rahal! For the rounder look, your barber will have to trim the hair in sections on dry hair. To keep it looking pristine, get a trim every 6-8 weeks. How To Style At Home: For Yassine’s look, rub some serum in your hands and comb through the hair with your fingers (not a brush or comb) and scrunch the hair all over using your hands. Dry using a diffuser. What To Ask Your Barber For: Jordan’s hair is similar to Yassine’s, but just has a bit more length. It’s a very curly style that, if you’re naturally straight-haired, you could get with a good perm. It’s a one-length cut that just needs a regular trim to keep it healthy. How To Style At Home: For this soft style, you’ll need to add serum to wet hair, comb out with a wide-toothed comb, then either air-dry or dry with a diffuser. Put back into a loose low ponytail for that laid-back smooth look. Here are a few bonus tips for you to keep in mind if you have long thick hair. 1. Forget about wash and go shampoo/conditioner combos. Those can be left behind in your buzz-cut or short-back-and-sides days where they belong. After all, you’re not an animal. You’re now in the special shampoo, separate conditioner and even hair mask league. 2. Don’t be afraid to experiment with what you’ve got. There are no mistakes (apart from maybe the bowl cut). If it’s good enough for the celebs, it’s good enough for you. Bear in mind that the best looks are the natural-not-made-much-effort ones that show you care, but aren’t trying too hard to get it right. Slick your long hair back into a low or high ponytail or bun or even a half-bun and look badass. 3. Play around with hair accessories. There are some awesome bandanas, and thick or thin soft or hard plastic headbands you could go for. Have fun with it! 4. Hats are your friend. For covering bad hair days or when you just want that extra edge, hats with long hair look bomb — even if it’s making all those dudes with thinning hair envious. Our initial thought is to tell you to avoid this unicorn look, but, then again, The Fat Jew seems to be quite the hit with the ladies, so what do we know!?! If this is what you’re leaning towards (and you’re daring enough) then go for it! Mazel tov! ORIS INTRODUCES ITS SECOND LIMITED EDITION BRONZE WATCH IN HONOUR OF HEROIC NAVY MASTERDIVER, CARL BRASHEAR.